10/29/03: There is no longer any EV1 service available here. 2002-1-18: Karen Casner: This location is now an EV1 servicing dealer, so there may be some contention for the charger. From CA-99 (North or South) take the Elk Grove Blvd. exit, then head West on Elk Grove Blvd. From 99 South, Right on Elk Grove Blvd. ; from 99 North, Left on Elk Grove Blvd.) (Elk Grove Blvd. is County Highway E12.) Turn left onto Auto Center Drive (First stop light). Turn left at the end of Auto Center Drive (about 0.2 miles) onto Laguna Grove Drive. Saturn of Elk Grove is on your right. 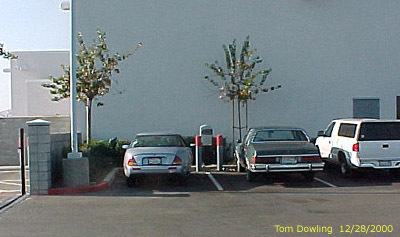 The charger is at the left rear corner of the building. About a 0.3 mile walk back to Elk Grove Blvd., you'll find Blimpie Subs, Lyons Restaurant, Casa Gomez Mexican Restaurant, Pak N Save Foods and Deli, Super Cuts, WalMart, TCBY Treats. The Plantation Coffee Shop is inside the nearby Chevy dealer. Of course, there is the standard deluxe Saturn customer lounge and waiting area. Call 916-691-8000 to check availability. Generated on Sunday, 1/30/2011, at 10:47:03 PM PT from evcnall.fp7. 7/12/2007: Added "I Was There" report. 12/28/2006: Added "I Was There" report. 9/15/2006: Added "I Was There" report. 2/21/2005: Added "I Was There" report. 11/17/2004: Added "I Was There" report. 10/29/03: Added new map, status, charger location, to-do, driving directions, photo, and deleted EV1 Club link.